From humble beginnings as the son of a gardener, John Gould’s passion for observing nature and his interest in taxidermy would eventually lead him to become the Curator and Preserver for the Zoological Society of London. In this role, he specialized in avian identification and description, becoming a noted ornithologist and artist who produced beautifully-illustrated volumes on birds of the world. 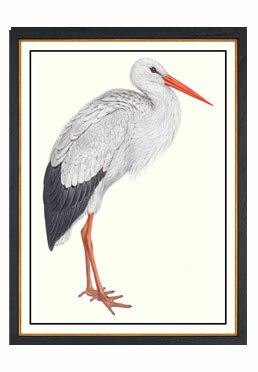 This high-quality print on premium archival paper with a 125-year lifetime rating, is framed with solid wood and suitable for any interior space. Our exclusive Biltmore artwork collection presents reproductions of an array of original engravings, etchings, and prints from George Vanderbilt’s private library and art collection at Biltmore in Asheville, NC.